Here are the presentations that were given at the Year 12 – Post GCSE Options parent’s evening. They can also be found in the School Info – Information Evening Presentations section. Below you will find links to our development proposal documents for 2016. We are aiming to increase our admission number from 125 to 130 pupils (in Year 8) with an increase in enrolment number from 815 to 897 pupils, starting from September 2017 or as soon as possible thereafter. Additional details can be found in the full development proposal. On Monday 9th May at 7.30 pm in the John Armstrong Hall, Dalriada will hold an information evening for the parents of current P6’s who are seeking to join Dalriada in year 8 in September 2017. 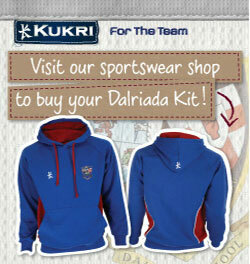 There will be a presentation outlining the process that Dalriada employs for the selection of pupils into Year 8. Details of the Common Entrance Assessment run by the Association for Quality Education will be explained along with information about how to apply. Furthermore the Headmaster will outline the timeline involved along with the school’s entrance criteria and how to apply for any special access arrangements that maybe required. If you require any further information about the meeting please contact the school on 028 276 63066. If you require wheelchair access please also contact us so we can be prepared for your arrival. Please find below a letter given to pupils today to take home. It contains information about a number of changes brought about by the building projects currently running in school. 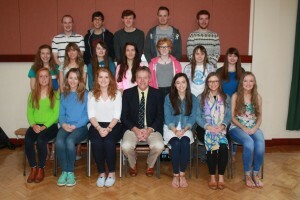 CCEA have officially notified the school of the top performers in its recent summer GCE and GCSE exams. 3rd Place in GCSE English Language – Peter Forde. Congratulations to all the pupils and also to the eight departments represented. This adds to the highly successful year that the school enjoyed in terms of examination results at all levels. Our Kukri shop is now open again for additional orders. It will close again on Friday 4th Sept. Expected delivery time at present for these items will be late October /early November. Please click on the logo on the right hand side of the page and follow the instructions. Students and teachers at Dalriada School are celebrating the school’s best set of A level results since 2007. An outstanding 80% of Dalriada‘s upper sixth form students obtained at least 3 A*-C grades each, well above the NI average for grammar schools. The results re-affirm Dalriada’s position as one of the leading grammar schools in the province. Special praise has to go to Thomas Hancock who gained 5 A* grades in Further Maths, French, Physics, Music and Mathematics. Additionally Sarah Cassells obtained 3 A*s in Art and Design, Biology and Chemistry. GCSE results are available for collection from the school on Thursday 20th August from 9 am. Results by phone will be available after 11 am through the office. As previously informed all year 12 have been scheduled for an interview with a member of the Careers Department to confirm subjects for the coming year. If unable to attend your interview in person, pupils must phone and speak to the Careers Department before 2.30 pm. Please note any results not collected by 3.30 pm will be posted home. 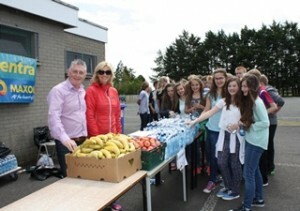 On Thursday 18th June Dalriada Pupils embarked on their annual Dalriada Dander. All pupils in Years 8 to 10 took part in a sponsored 5 km walk around the school grounds. Pupils were raising money towards new ICT equipment for the school. The weather was kind to us and the rain stayed away for the afternoon. 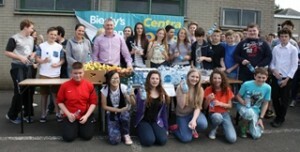 This enabled the pupils to enjoy some appreciated refreshments kindly provided by Biesty’s Centra, Ballymoney. During the week the Year 11 pupils contributed to the fundraising by providing delicious buns and treats for sale. The event was a great success raising a combined total of an amazing £5316.46. Dalriada School appreciates the support of all the friends and family who sponsored a pupil. Are ye goin’ fur a dander? This years Dalriada Dander will take place on Thursday 18th June. All year 8-10 pupils are taking part and the money raised will be used to buy ICT equipment for the Geography department.